Now available for purchase here on Ravelry! 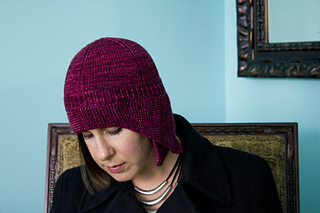 Velma is a close-fitting cloche-style hat with an asymmetrical brim that can be worn either up or down. 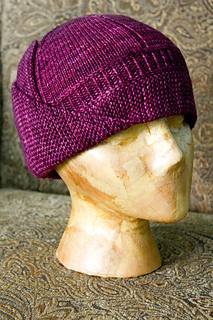 The brim of the hat is knitted flat. Then, stitches are picked up along the top edge and joined for working in the round. The twisted rib of the band (flanked by lateral braids) is an homage to the grosgrain ribbon bands that frequently adorned the hats of the era. 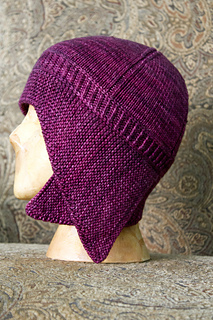 Note: Blocking is not recommended for the finished hat, as it may cause the flaps to lose the rigidity that helps them hold an “upright” position. The Velma pattern was originally created for the February 2014 installment of the Woolen Rabbit Yarn Club.